This time period appears again and again in the scriptures of various religions, but especially in the christian bible (which may have inherited it from paganism) where it, amongst other things, measures the period of Lent. The day of this posting will mark the reaching of Forty Days and Forty Nights by an example of something far less spiritual but very detrimental to the realization of the goal of Copenhagenization. And this is an important topic to address and discuss as North America begins to see an explosion in the addition of bicycle infrastructure to its "Complete Streets" where cars are no longer allowed to totally dominate as they not long ago did. In most of the pictures throughout this post, you see the results of a contractor (in the United States this is usually the firm that submitted the lowest bid to do the job) working on underground utilities and the damage done to a paint-only bicycle infrastructure project. Was once quite a rare sight on this street. Some background first. This street is located in the broad urban expanses of the area known as Southern California. I'm not going to identify where because I don't desire to use my contributions to this blog to pick on a particular city or utility company...at least not yet! And it really doesn't matter because this could be anywhere on the continent as this sort of thing happens all the time and everywhere in North America, not only to bike lane striping but to other markings like crosswalks and stop-lines which are intended to make the roadway safer for its non-motorized users. 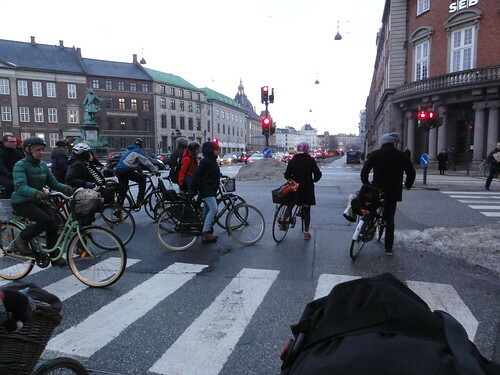 In truth, the city where these pictures are taken is actually very progressive, for one in North America, in its pursuance of bicycle "friendliness". The city which-shall-remain-nameless really cares about promoting cycle use, so can you imagine how long this sort of thing would fester in a place that pays only lip-service to cycling? Sometimes the removal of paint on roadway is caused by utility work, as in this case. Other times it is due to a failure to repaint sun-faded markings over time, or wear and tear from winter work like salting and plowing. But since this situation is an example I've been able to document and monitor, it will be our laboratory rat or guinea pig today. The street in question used to be a four-lane "facility" with curbside parking on each side, no turn lanes and no accommodations for bicycles what-so-ever. The speed limit was routinely being exceeded by motor vehicles and this street was easily a candidate for at least a five miles-per-hour increase thanks to the incredibly biased method of setting speed limits known as The 85th-Percentile. Indeed the street has a higher speed limit when it crosses over into the adjoining city because there it passes by some formally industrial areas. California has a good number of what it uniquely defines as "Class One" bicycle paths. 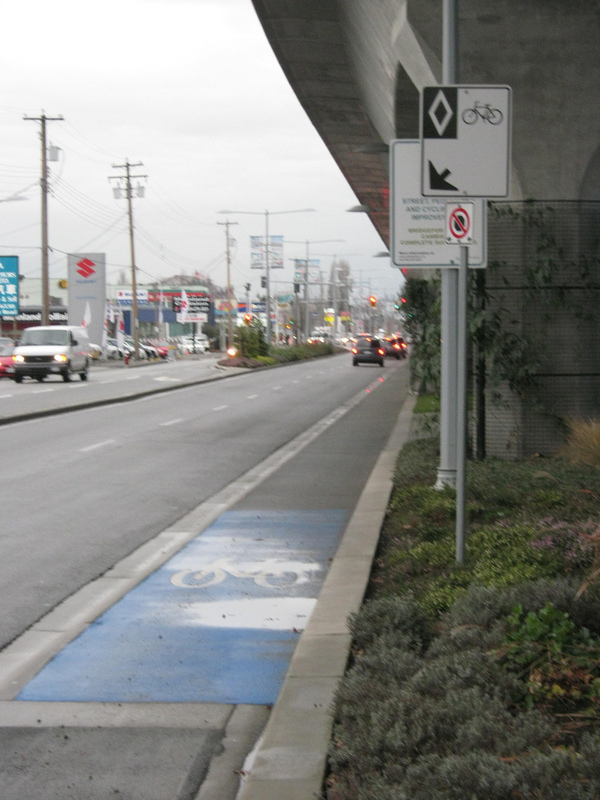 They are exactly that, paths which offer a cyclists an unfettered ride, usually only occasionally intersecting cross-streets, and in many cases offering overpasses or underpasses to do so. Unfortunately while these paths are usually pleasant and well used by recreational cyclists plus what the Dutch call "Wheel-runners" they almost never run past places that a person might work/study or want to go to and visit and/or shop. These follow routes that are often facilitated by abandoned railroad corridors, or rivers (many of which in this area have been cemented into the high-capacity floodwater drainage channels that are very necessary when rainy weather does come). That is what the above "bicycle facility" was intended to be; funds had been set aside to build a separated segregated "Class One" path. Unfortunately the land along which the path was to run became unavailable. So the funds were re-purposed such that they were used to place a "road diet" on this, our guinea pig street. But of course, the cyclist pictogram is wearing a helmet. So the dedicated pot of money, that had been intended solely for bicycles was instead used to scrape off the old asphalt from the street and lay a fresh new and smooth layer. Also, these funds were used to buy and install a number of new traffic signals and refurbish some existing ones so that they would recognize bicycles and cars using video cameras. Certainly not an insignificant cost when you consider that a basic set of traffic signals now pencils in at around US$200,000, and the video camera detection systems can add at least ten percent to that number. That did make the street easier for bicycles to travel on as these signals replaced a closely-spaced series of "Four-Way" Stop Signs, except this signalization always creates potential motorist/non-motorist conflict thanks the the USA's blanket permission of "Right-turn-on-Red (Light)". Finally the striping-layout shown in the diagram above was painted onto the street, except of course this being the USA, a land with far too many lawyers, the street's bicyclist pictogram has a helmet on. Now a very popular route. So, effectively, funds originally set aside for bicycles were used to perform overdue refurbishment (because the funding mechanism for streets, a fixed surcharge per gallon of fuel, has not been increased in over 20 years) on a road also used by cars and add traffic signals that do not actually offer any special features for bicyclists apart from being able to be triggered (unless the sun is rising or setting!) by cyclists. But the discussion of that inequality and further subsidy of the motor vehicle by persons who are not necessarily users of the automobile infrastructure can be left to another time. The road diet has been successful. First and foremost, this street did not need all the capacity that having two lanes in each direction was providing; It simply did not have the motor vehicle volume. While this is one of a longer street street in surrounding area, it does terminate in the city in which the photos are taken and so does not function as a long-distance alternative to the overcrowded "freeway" system, which many motorists in Southern California are now chosing to avoid by using these more predictable "surface streets". The street now has a center lane for turns which has two obvious benefits. 1)Motorists needing to take a left hand turn now can sit in a demarcated refuge awaiting their opportunity to turn, and do so without blocking the other motorists who happened to be behind them, in the same lane, under the old layout. 2)When crossing oncoming traffic, the motorists only have one lane of on-coming motor traffic and therefore less oncoming vehicles to look through or around (for cyclists) to make the judgement on whether it is safe or not to complete the turn. Finally the center lane is almost always empty except for those aforementioned left-hand turning motorists, and it can be quickly vacated by those in it either by completing the intended turn or re-merging into their own lane of travel. This means that the roadway effectively always has a way to permit emergency vehicles to pass less hindered than they would be when the "four-lane" street existed, especially if, for some reason, that old street layout was full of motorists. Which is a good thing since there is at least one fire station nearby and, as is typical of public safety resources management in the USA, it usually dispatches a full size fire truck along with what the rest of the world calls a "crash-car" (except it is a pick-up truck like the one from the TV Show "Emergency!") to almost every call, regardless of need. 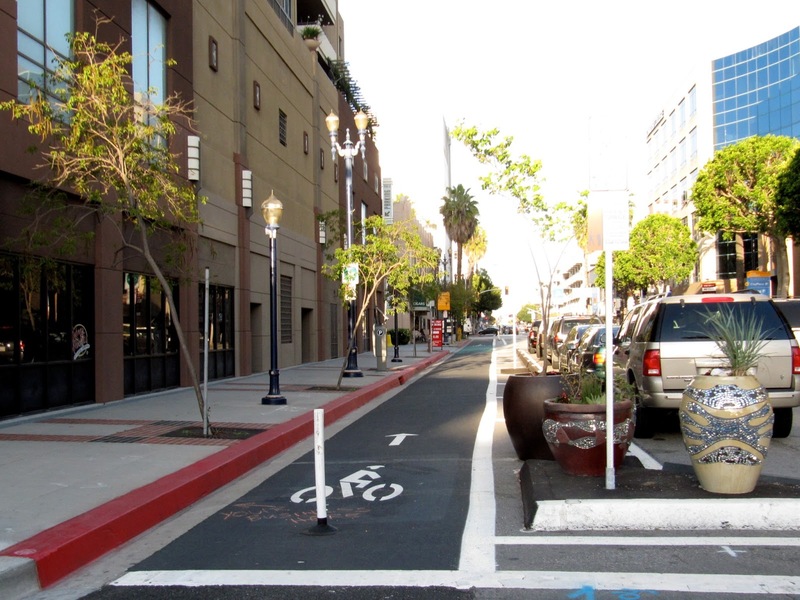 That center-lane creation is an important selling point because increasingly, at least in the United States, it is the Public Safety profession who object to or intervene to stop traffic-calming an bicycle-accommodating modifications of infrastructure. So in the end cyclists ended up with two painted bike lanes on a street that is useful to many and is staying at the posted speed limit . Which brings us back to our contractor-created "scar". Good thing no vehicles are parked here today! Work was done on some sort of a pipe, which appears in this case to be for water, the clue being the blue spray paint. The contractor dug into the asphalt to create a trench to either install, remove or repair that pipe. The digging occurred along the length of one of the two stripes that make up the painted bike lane. Once finished, the contractor replaced the dirt and put down some asphalt, which is now not only devoid of striping but also quite rough. One would have hoped that the rough asphalt was preliminary and that there would be a second visit by the contractor to smooth and restripe, but that was 40 days ago. So it looks like this is now permanent. Savvy SUV-driver "taking the lane"? 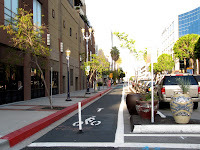 Cyclists now have a situation where cars drift into the space formerly taken up by the bike lane, space which is uncomfortable to ride in, forcing cyclists to ride in the parking lane if it is not occupied. The roadway that was made smooth for all users by expropriating bike path funding is now very rough precisely where cyclists are trying to use it. The motorist is now given the impression that the painted cycle lane is gone and that they now lord over a sixteen-foot-wide (4.87 m) traffic lane, although to some extent the roughness of the current asphalt keeps drivers not in vehicles designed for off-road use (like the plentiful Sport Utility Vehicles (SUVs)) ride hard against the center divider. To add insult to injury, when the asphalt that is in place was poured, it was done in such a sloppy manner that a short portion of the right edge of the former bicycle lane is also now obscured. Because the pipes needing repair or modification lay under it (another argument for cycletracks between parking and the sidewalk!) the bicycle facility is now, for stretch of over 400 feet (121 m) effectively gone. While not a huge distance, it is long enough to create difficulties and anxiety for the type of cyclist these facilities are supposed to encourage. The scar also took out some of the crosswalk striping, so pedestrians too lose a part of the road diet improvements devoted to them. If the contractor's job had been larger, more of the painted bike lane would now be removed permanently. This demonstrates what can happen quickly to all the good work being done right now if attitudes and regulations about bicycles in the profession of Construction Management are not changed and if the overseers of this infrastructure are not vigilant in making sure that what gets taken away is immediately put back. Simple temporary lane markings are available to the construction industry, why were they not used here? And if the parking and bicycle lanes were flipped here as they are in Copenhagen, it would have been the under-utilized parking that was disrupted or scarred, not the travel lane of a mode that the city is trying to encourage. But really more to the point, isn't it time to insist that where possible, bicycle infrastructure gets built in a manner in which a sudden removal is made less possible? 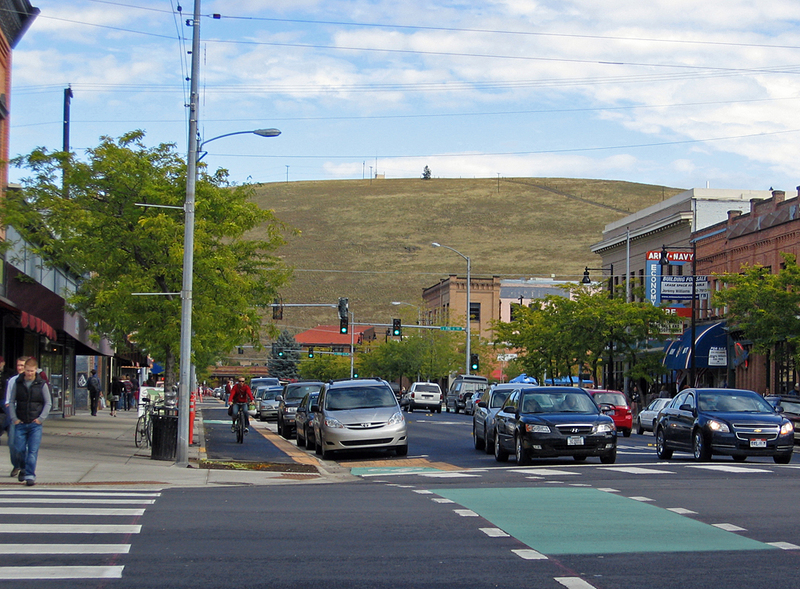 Physical separation using traffic islands or raised aprons or recessed curbing as seen in places like Long Beach, California or Missoula, (yes, Missoula!) Montana or Richmond, British Columbia show what is already in use in North America. These forms of infrastructure are harder for a thoughtless site foreman to destroy or for negligent city staff to delete by means of apathy. They imply permanence by their construction and they are what your city and its cyclists deserve.